Bryant LeMaire Boatner was born in New Orleans, Louisiana, in 1907. He graduated from the U.S. Military Academy and was commissioned a second lieutenant of Field Artillery in 1928. After attending flying schools at Brooks and Kelly fields, Texas, he was transferred to the Air Corps as a second lieutenant in November 1929, and assigned as squadron engineering and operations officer at Selfridge Field, Michigan. In October 1934, General Boatner went to Wheeler Field, Hawaii as assistant station supply officer, operations officer and squadron commander. In the fall of 1936, he was assigned to Barksdale Field, Louisiana, where he served as operations officer, flight commanding officer and adjutant. In August 1938, he went to the Air Corps Engineering School at Wright Field, Ohio, from which he graduated a year later. He then was stationed there from August 1939, until June 1945 as chief of the Attack and Observation Branch. Modification Section. In July 1943, he became assistant chief of the Production Division, serving until February 1944, when he was appointed assistant chief of the Inspection Division. Two months later he became chief of that division. In September 1944, General Boatner was named chief of the Quality Control Section of the Procurement Division, and in June 1945, was appointed deputy chief of the Procurement Division and chief of the Inspection Section. That same month he was sent to the 501st Army Air Force Base Unit in Washington, D.C. for indoctrination in Air Transport Command policies and procedures. General Boatner, in August 1945, went to Europe as deputy division commander of the 1400th Army Air Force Base Unit, and the following November became commanding officer of the European Wing (Provisional) of Air Transport Command. 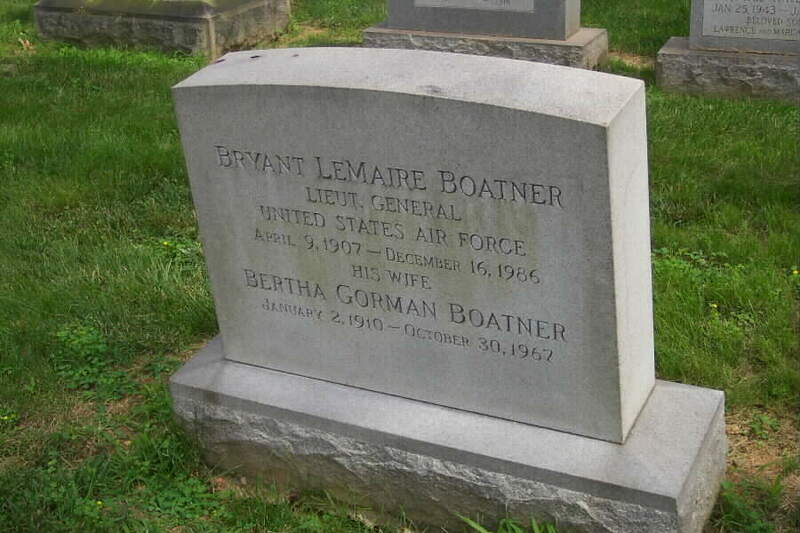 General Boatner was assigned, in April 1946, to Army Air Force Headquarters as secretary of the air staff and executive to the deputy commander of the Army Air Force. In January 1947, he was designated deputy chief of Air Staff in addition to his other duties, and the following June was relieved as executive to the deputy commander. In October 1947, after U.S. Air Force headquarters was established he was appointed secretary of the Air Staff. Still at U.S. Air Force Headquarters, General Boatner was appointed assistant deputy chief of staff for personnel and administration, in February 1948. In May of the following year he became assistant comptroller, and in September of that year was redesignated assistant deputy chief of staff, comptroller. General Boatner assumed command of the Air Proving Ground at Eglin Air Force Base, Florida, in July 1950. Returning to Air Force headquarters in July 1952, General Boatner was appointed The inspector general of the Air Force. On April 1, 1954, he was designated deputy chief of staff, materiel, there. His decorations include the Distinguished Service Medal, Legion of Merit and the French Legion of Merit. He is rated a command pilot, combat observer and aircraft observer. He was promoted to first lieutenant February 1, 1934, to captain (temporary) March 12, 1935; to captain (permanent) June 9, 1938; to major (temporary) February 1, 1941; to lieutenant colonel (temporary) January 5, 1942; to colonel (temporary) March 1, 1942; to major (permanent) June 9, 1945; to brigadier general (temporary) February 4, 1947; to colonel (permanent) April 2, 1948; to major general (temporary) April 8, 1948; to brigadier general (permanent) January 27, 1950; to major general (permanent) October 9, 1951; to lieutenant general (temporary) September 5, 1952. General Boatner Retired August. 31 1955 and died December 16, 1986. He was buried in Section 1 of Arlington National Cemetery with full military honors. 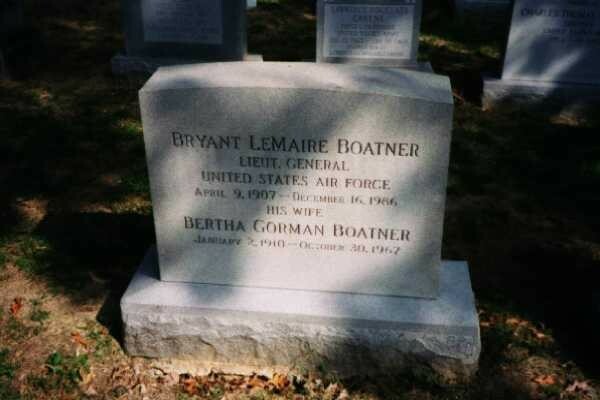 Note: His brother, Hayden LeMaire Boatner, Major General, United States Army, is also buried in Arlington National Cemetery.